My wife decided that since I wasn't going to quit smoking and she didn't want me smoking in the cold garage anymore. My attached garage is insulated and has a doggie-door for our outside dogs. $20 will get you an electric milkhouse heater from Lowes which will keep you and the dogs quite content in an insulated garage for any outside temp down to the low 20s. Its attached with 6 inch insulated walls and I have an Eden pure that runs all the time, never drops below 60 no matter how cold it is outside. Plus, I've got a propane torpedo that I used to use to heat new houses back when I did construction if I want to turn it into a sweat lodge. T-shirt weather to me is cold to her. I guess I should have added I think that this is her way of telling me to build a gun room without saying so. I smoked for two years. Started smoking about 30 minutes after came home and discovered wife had cleaned out house and left with no warning. Had no television, stereo, even a chair to sit in so went and bought a pack of smokes and about two years later realized smoking above 18,000 feet was a pain in the @$$ so quit. Just laid them down, went from two packs of unfiltered Lucky Strikes per day to none overnight. Had I let habit go on decade or more imagine it would have been harder. My day smoked unfiltered Pall Mall's from age 14 to age 60 when he spent three weeks in hospital from flu. Year before had spent a week and year before a few nights in hospital from flu and was getting a bad case or two every year for previous decade. Doctor said every time he got the flu every year it was worse and took longer to get over. Told him if kept smoking next time or following would die. Told him had choice, keep smoking or die from flu in less than five years. The smoking made lungs weaker and more difficult to heal from any sickness. Every cold became flu, then flu began upgrading to pneumonia and after 50+ years of smoking 2.5 packs per day he laid them down and quit cold turkey. Have friends now that tried the patch and wear patch and still smoke. One friend has aunt that wears patch, chews nicotine gum and smokes. Sometimes the crutch to help people quit becomes the new bad habit. Friend of wife's who recently died used paths and gum to quit. She did stop smoking but last decade of life always had a patch on and was chewing nicotine gum. My basement and gun rooms are on whole house HVAC system plus have four new in box window units in storage in case HVAC went out. Also if power grid goes down could put window unit in four rooms and run one or two at a time to keep humidity and temps reasonable while on generator power based in rooms occupying. Can buy window units cheap at home improvement centers or Walmart every fall when they put on clearance. If HVAC goes down one weekend and cant get a tech to house just slamming one in bedroom window might make wife very happy on hot summer weekend. I have an Eden pure that runs all the time, never drops below 60 no matter how cold it is outside. I had to Google what an "Eden pure" was and it sounds interesting. What model do you use? Additional thoughts? PM me if you prefer. Mine is a model 1000. I bought it for my parents the last winter before they past away when I stopped by without giving my mom warning and found she had the furnace set on 65 because she was afraid of spending too much on the gas bill. It kept their living room too hot for me to be comfortable after I convinced her electricity was cheaper than natural gas. She wouldn't let me just pay their bills. I bought a second one for their bedroom. The 2 of them kept a 1400sq ft 50's ranch house hovering around 80 when it was zero outside. The following winter after they both died one of my buddies had a little girl and they couldn't keep her bedroom heated well in their farmhouse so I gave them one and put the other one in my garage. It keeps up in a 3 car ok even with the door opening and closing to come one go. It won't keep up if you are bringing cars in to park from the outside though. Too much heat loss with a big chunk of cold metal radiating cold. I have the garage taken up sons trans am and my m1009 torn apart this winter so it's not an issue. They are quite and just sit and pump out heat kind of pricey though, but they have knock offs now too. Is the loss of Span a bad thing or a blessing? I might venture to say blessing unless didn't discover till hungry and grocery stores wiped out. Kroger has a super event forming if use their App, on their mailing list for print coupons and manufacturers coupons. Had to log in on 10th or 11th and click on items use that qualify and have to buy them 12th through 14th. Almond milk that we commonly store six months unrefridgerated is normally $2.99 to $3.49. Today and tomorrow (Saturday between opening and noon have a special on fuel points where will get 8x points on some items) will be $1.49 per half gallon. We have over a dozen commonly used items that will store from six months to over a decade that will be half price with 4x to 8x fuel points when go grocery shopping after Bible Study and prayer breakfast tomorrow. Also a lot of other items with huge discounts that plan to buy more than need like condoms and feminine hygene. 18 count packages of Scott toilet paper are going to be hugely discounted and kept dry never seen toilet paper go bad. We are taking two trucks to grocery store so able to get planned purchases home. SHTF and tampons might trade for more than gold. Groups of people confined together and condoms will be a big trade item. People think I am odd about how many high capacity magazines I buy and store for panics and future bans. Should see the food, medicine and hygene supplies. Want to be stuck in house with half a dozen adults in Georgia summer and not have deodorant? We have more toothpaste than most Walmarts. Of course dental reps always give it to wife by the case like tooth brushes. So if a man can eat Spam and stockpiles it better be sure of storage methods. My biggest item past few moths is coffee. See a good sale and wipe the shelf. Thought had plenty looking at shelves loaded with sealed cans but did math and at two pots per day only had two years worth. Not enough if have company during a SHTF party/zombie apocalypse with people having to pull watch during the night. Want to be able to be four pots per day for four years minimum. Coffee is my real addiction.
" and about two years later realized smoking above 18,000 feet was a pain in the @$$ so quit." One of my favorite summit photos is the American Annapurna Woman's Expedition, a couple of the girls even swing the O2 mask away so you can see their face but most of the girls keep it on.... And in the background is a sherpa squatting on his heels smoking a cigarette. The problem might just of been what you were smoking. One of my old partners, Scott Fisher, died in the big tragedy trying to save his clients climbed without oxygen and smoked all the way to the summit of Everest. Even after I quit smoking always carried a carton on a climb for trading with locals. Cigarettes are as good or better than cash. Amazing how many porters smoked. We had a guy from Peru whose nickname in the Himalaya interpreted as "the man who makes the Shera cry". Jorge could carry more loads to high camps and short rope more clients to summits than any of the local Sherpa. Then there was "the maestro" Allehandro who told his son wanted to summit Huascarán on his 60th birthday. He kept our base camps clean and porters hopping. All would take a smoke whenever offered. 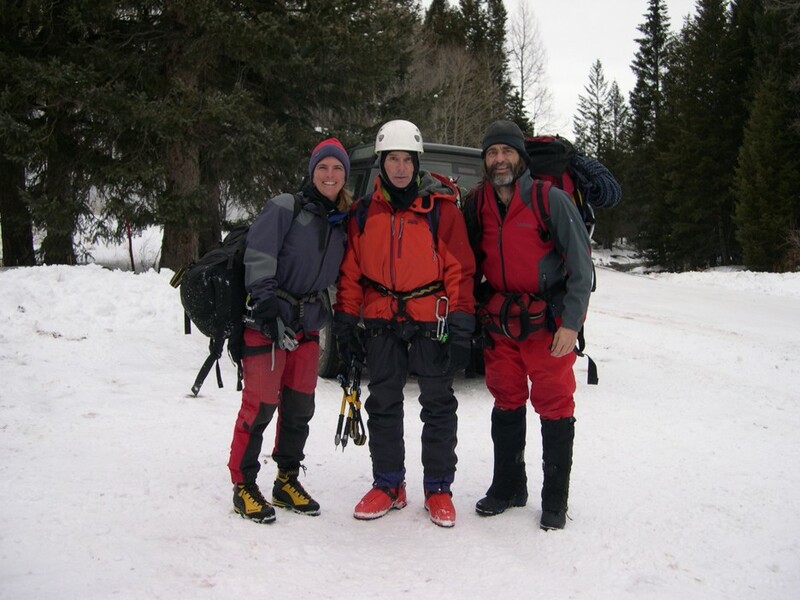 Below is Christine Boskoff, Charlie Fowler (he would split a smoke when Christine was not watching) and myself near their home in Norwood Colo"rad"o winter before they dissapeared in China peak bagging without permits. We climbed the coolest frozen waterfalls of my career that day and next day were in t-shirts climbing rock in southern Utah. Christine was tough at altitude but Charlie may have been one of the most talented climbers to ever live. Wjen wife and I had our place in Ouray would climb with them every winter. Charlie was originally from North Carolina but met him in Ouray 1992, met Christine after Charle before her husband died when she lived in Atlanta and was first bagging 8,000 meter peaks. Had it not been for a broken back and neck my exit plan from life was an avalanche or storm. Never intended to live past 55. Climbers don't age gracefully and few of the really good ones lived past 50. More of my mountaineering friends are dead than alive. Great way to live. Why I am so into survival now. Assume God took me out of the climbing life to keep me alive for something. Miss the heck out of the people. Leaving base camp at midnight to bag a peak, starting up a sketchy frozen waterfall or the North Face of the Eiger solo in winter with 50/50 odds that it might kill you was always life affirming when sitting and watching the sunset at end of a day. Special kind of people who rope up without fear of death as a way of life. 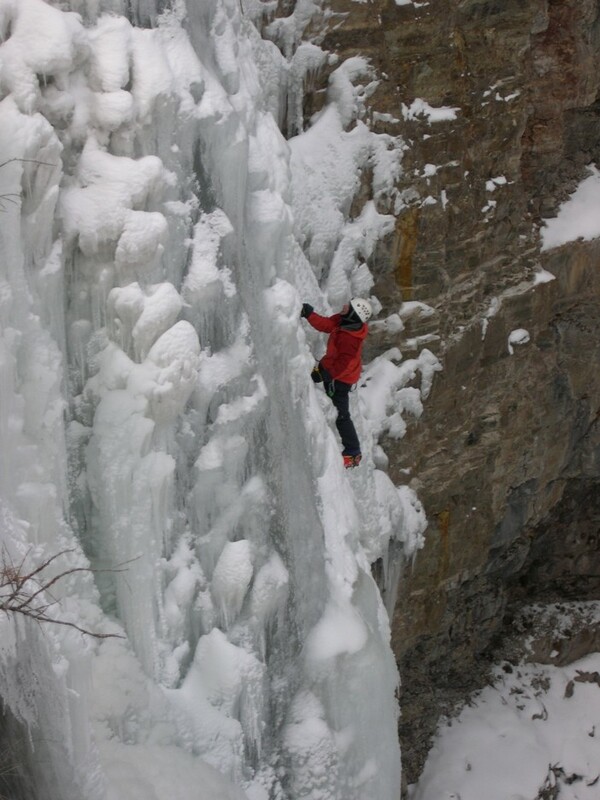 Charlie on Ames Falls, not to be confused with Ames Ice Hose which was a different day. First 100 ft are dead vertical with nice overhanging buldge to pull before gaining final slabs to top. Kind of climb that would wind your watch. No matter where you are and what's going on, having a pack or carton of cigarettes is mandatory. Have a case put back myself. If zombies start wandering I am going to start smoking again. Only smoked two years but still miss it. I believe the smokes at altitude were causing my sleep apnea to act up more than the smoking was hurting me. Dang, now I want a Lucky Strike. All times are GMT -5. The time now is 08:41.